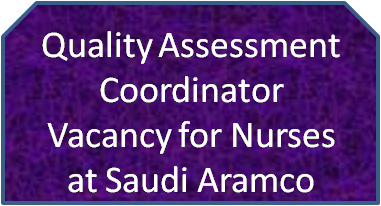 Saudi Aramco, the worlds number one oil producer, now announced a vacancy that can be applied by a professional Nurse. This wonderful opportunity can be utilized by any of our fellow readers. The job responsibilities are as given below. The details are as mentioned in their website, without any change in order to avoid any errors and confusion. You will be accountable for the coordination of quality assurance and quality improvement activities in the Medical Compliance division of Healthcare JV Coordination Department, and for the implementation of quality improvement functions. You will be responsible for the validation of the measurement and reporting of Service Agreement Key Performance Indicators and Partner Contribution Agreement Key Performance Indicators, in accordance with contractual obligations. You will oversee/coordinate/review/monitor the regulatory and accreditation activities of JHAH and coordinate correction & resolution of deficiencies. You will oversee/coordinate/review/monitor quality programs specific to Saudi Aramco Safety Management System incorporating elements such as Risk Assessment, Incident Reporting and Analysis & Continuous Improvement." Click here to reach the original source to see full details and apply directly.